Jordan is a beautiful, fun and safe country to visit. This tour provided a great balance of active hiking and sightseeing. The tour guide was simply perfect and the tour provided a good balance of organized activities and free time. Jordan is an amazing place. The people are one of the most friendly and helpful I've ever come across. The landscape is very much like Utah I believe but the likes of Petra, Jerash etc. cannot be found there. 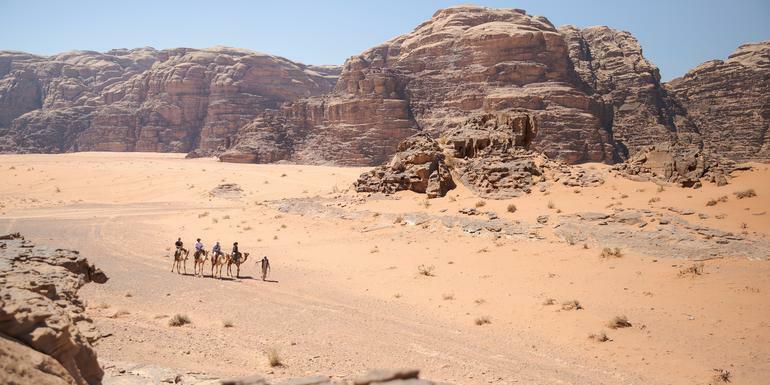 The GAdventure adventure trip includes the great trekking available but also the amazing culture availablein Jordan, a real gem of a holiday. Loved the trip and Jordan. Even though it was called Jordan multi-sport, we only hiked so perhaps they need to change the name to hiking Jordan. Overall, the country is beautiful and Petra was stunning. No complaints. AMAZED, STUNNED, MIND-BLOWN. Thank you Jihad!!!!!!!!!!! Only ground transport Private van/bus, 4x4, bike, hike, walking. On this trip we will travel by air-conditioned private buses for most of the journeys. En route to Wadi Rum and our desert camp we will travel in 4x4 vehicles. RAMADAN According to the lunar cycle, Ramadan will fall between May 5th and June 4th, 2019. Please note that Ramadan is a month of fasting observed by Muslims throughout the world, during which time the followers of Islam should not eat or drink between sunrise and sunset. There may be some limitations to services and disruptions to schedules during Ramadan, but generally our tours still operate effectively during this period and food is available to non-Muslims throughout the day. It is very important to display increased cultural sensitivity during Ramadan. Please wear loose fitting clothes, that cover knees and shoulders, and try to avoid eating, drinking or smoking in public out of respect for those who can't at that time.